City map showing streets, railroads, and ward boundaries (wards 1-10), from 24th Street in the west to Mt. Elliott Avenue in the east. Some major buildings are shown and named. 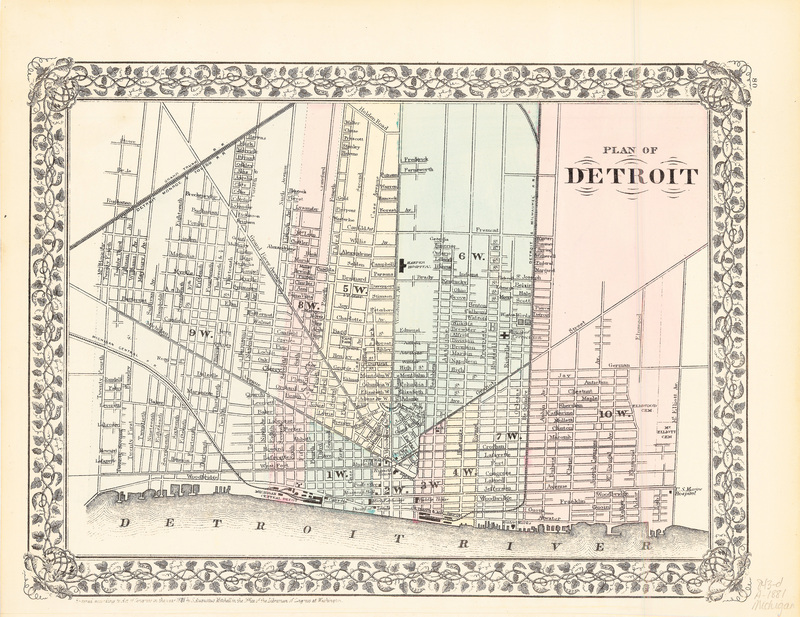 Differs significantly from Mitchell's 1882 map of Detroit. Map is surrounded by ornamental border of plant forms. Oriented with north to upper right. Detached from an edition of: Mitchell's New General Atlas. Plate 80. "Entered according to Act of Congress in the year 1881 by S. Augustus Mitchell in the Office of the Librarian of Congress at Washington." Eastern portion of a general map of the state of Michigan on verso (plate 79). Scale not given.